Found 81 entries in 0.128 seconds. I wanted to offer Denth the chance for redemption here, though there was no way he was going to let himself take it. His response is honest. He doesn't feel he deserves it. He has done terrible things; to wipe away the memory of them would be cheating. Better to just get it over with. There's a very good chance that after killing Vasher, Denth would have walked over, picked up Nightblood, and let the sword drain his life away. He wouldn't have been able to live with the guilt. But that doesn't happen. When I first designed this magic system, I added to it the idea that taking a lot of Breath shocks you and sends you into a small seizure of pleasure. This is lifted from the magic system in Mythwalker, the story from which I drew Siri and Vivenna. I added the component to Awakening not only because it fit, but because I liked giving one more little nod to Mythwalker. However, the moment I began writing it, I knew that this twist of giving someone Breath, then killing them, would be an awesome way to pull a reversal with the magic. So I built into the story the entire arc of Vasher beating Arsteel mysteriously, and Denth wanting to duel him to prove that he couldn't win a duel. Would the Scadrian be able to use it? Yes. You have seen people from off-planet who have Breath before. Uhuh. *laughter* And are making use of it in a variety of ways. And here we have a big scene that a lot of readers have been waiting for. I apologize for making Siri need to be rescued like this, but I felt it was appropriate to the story. It's because of her teaching the God King and helping him become the man he is that he's able to do this. Remember that the Seventh Heightening (I think that's the one) grants a person Instinctive Awakening, meaning that once you reach that Heightening, you don't need any practice to learn to Awaken. Your Commands are obeyed instinctively. This doesn't mean that everything you try will work, but that you can make most basic Commands (grab things, that sort) work without having to try. In fact, figuring out most of the more complicated, previously unknown Commands requires a person to be of the Seventh Heightening. What happens when non-Nalthians come to Nalthis. They cannot use their own soul to Awaken but could do so with obtained Breath. So anyone could start Awakening once they received Breaths? You would probably have to jump through some hoops to Awaken (talks about systems needing rigged up to work on different planets), but anyone can benefit from a Breath. Essentially said "it's not that easy!" What would life on Nalthis be like for someone with synesthesia? Synesthesia on Nalthis isn't something I'd considered, but it would probably be about the same. Unless you had a lot of Breath, at which point things would get weird. You've said that Nalthians without Breath have something missing (are less invested) than other humans. Was this the case before Endowment invested on Nalthis? Would a non-Nalthian given Breath, who then gives up that Breath, be less invested than before they got the Breath? Would there be something missing in their spiritweb compared to their original state? So, no. If someone from Sel went to Nalthis and got a Breath and then gave it up, would it give up more, the answer would be no, they would be who they were before. I know that there's three sorts of forms that magic presents itself in, the liquid and the solid and air. What would Breath be? Breath is definitely like mist, it is in the form of the air. And is Stormlight the same? In the last panel we talked a lot about people from different planets using magic systems on other planets, one of the things I've been thinking about, we've been thinking about, talking about Breath, and people being born with Breath, is that something specific to Nalthis or do, technically, other people on other planets have a Breath as well? Good question and that is a Nalthian thing. Now, everyone in the cosmere to an extent has Investiture, the Nalthian Breath is part what everyone has and then a little extra, plus the ability to share it around. So a person who gives up their Breath on Nalthis is actually going below what a normal person has. But a normal person on Nalthis has more than somebody-- So if you were for instance to pick a world like Sixth of the Dusk, where there's not a Shard in residence, and you compared them to a Nalthian, Nalthian has an Investiture advantage over them. When they've given up their Breath, they have an Investiture disadvantage. So we're not Drabs. That's exactly it. We're not Drabs. *Written:* So somewhere it says that the number of Breaths doesn't determine the power of the object. But are the number of Breaths directly tied to how much Investiture is in an object? You're repeatedly said that Nightblood is ridiculously heavily Invested, more so than Shardblades, Honorblades, or the Bands of Mourning. But it only has a thousand Breaths, which doesn't seem all that much from the point of view of the God King--Tenth Heightening, over 50,000. So this is a RAFO, but you're starting to ask the right questions there. Okay? Suppose you had a full Feruchemist, who got enough Breath to reach the Fifth Heightening. What would happen if he started storing in atium? Hehe-- I'm going to RAFO that one. There's that trick with Feruchemy that lets you make metalminds that others can tap. Could you do something similar with Self-Awakening? Awaken an object so that others could access its Breaths? Is it possible to fuel that... Like, say could you fuel Awakening using Stormlight, or do you have to bring Breaths? Excellent question. Now it's-- there are tricks to making it happen on each world. Some are easier than others, but yes you can. So could that allow a loophole to maybe... convert from one form of power to another? Or like from Stormlight to Breath? --is on Roshar, is because it's a lot easier to get Stormlight than Breath. Hum. I like that suggestion, actually. I think I'll use it. Though, what I'll do is say that if you leave the breath in for too long, one of them vanishes. If you can get them back quickly enough, however, there is no loss. That gives a bit of a better explanation of why there aren't a lot of awakened objects doing things all over the place. True, using the breath to make them would be initially expensive--but if you got a magic object that never winds down, then that might be worth the expense. I teach economics at Rutgers and in general I love the books but *inaudible* I like to tease him because he loves them, and say it doesn’t really make sense to have a fixed price for Breaths and it doesn’t make sense that if you give it away when you’re young, and his claim was that somewhere in the book it talks about how the Breath actually gets weaker as you get older. So, dying Breaths can be much weaker, but not middle aged ones. So, you have a legitimate thing, my counter to you is, having listened to a ton of Freakonomics, economic people do not do what is logically economic, particularly in a closed system. You might find that Breaths sell for different things, or are treated differently, in other countries. But I do think about these things. Here’s the thing, there are fantasy writers who are actually economists, L.E. Modesit is the most famous one, and he-- I’ve been on panels where he’s complained about how writers, fantasy writers ignore economics, basic economics, all the time. So I try to listen at his feet a bit. Why a child? It doesn't much matter, truthfully. An adult, or even someone elderly, could provide a Breath that would keep a god alive. But the Breaths of those who are aged aren't as vigorous as those of those who are young. If Lightsong were given one of those to feed on, he'd survive for another week—but he wouldn't feel as vibrant or alive as he does after feeding on the child's Breath. The people of Hallandren are faithful. Even if Lightsong himself doesn't believe, they do, and they want to provide the best for him. Hence they use children. Old enough to know what they are doing, yet young enough to give a powerful, vibrant Breath to their god. Why is Breath not consumed in Awakening, unlike most all other uses of Investiture? Not all Investitures are "used up." Much like energy, it isn't typically created or destroyed, just changes for. With Breath, in what it's used for, it is just more easily and readily recovered than in other forms. How much power does a Breath and a freshly charged Hemalurgic spike have relative to each other? This is a RAFO. I don't want to be pinned down on this one quite yet. How difficult is it to transfer Investiture from one magic system to another, is it even possible? How difficult is it to transfer Investiture from one magic system to another. It is possible. It is more difficult with different magic systems. Breaths are easy. Stormlight is fairly easy. Others from there on get pretty hard. Can you tell me how many souls Hoid has? How many Breaths? No, but I can tell you you could look up the minimum he has based on the heightenings and things that he says. Right, and all that i know is that he has perfect pitch. Yeah. There is room to rise from that, so I'm not going to confirm anything else, just keep an eye on him. Alright, thanks. Last question for me tonight - so, when a Hemalurgic spike steals something, then it's storing Investiture in it, yeah? So could you - could you do something with that Investiture? Like... say I'm on Nalthis, and just theoretically, I use a Hemalurgic spike to steal a lot of Breath - can I use that Investiture to Awaken something? Could I Awaken the spike? That... you'd need a lot of Investiture to Awaken a spike. Because it's already charged up with something else? Is there any other magic types on the Warbreaker world? There are different manipulations and manifestations of Breath. They are gonna be much closer than, like, the Selish magic systems and things like that. So, the deviation is much smaller, but it does manifest in slightly different ways-- Kind of a thing. I asked if someone who had a lot of Breath would have it weaken collectively, in the same way that the single Breaths of children are more vibrant than others and move one slightly closer to a Heightening, then weaken as they grow older (and contribute slightly less towards a Heightening). He said that it wouldn't be noticeable once you accumulate enough Breath and, for example, Hoid wouldn't find himself suddenly losing perfect pitch as a function of time. I will confess that over the course of my study I learned that we're nearing the 10th Anniversary edition, and that [Brandon] has asked [Peter] to go over the book, take Brandon's notes, and make sure there is a consistent system behind the scenes. Humbly, I do hope that perhaps by at least locating the times in the book when Breath-count is mentioned, I have saved Peter a bit of busy work, if nothing else. 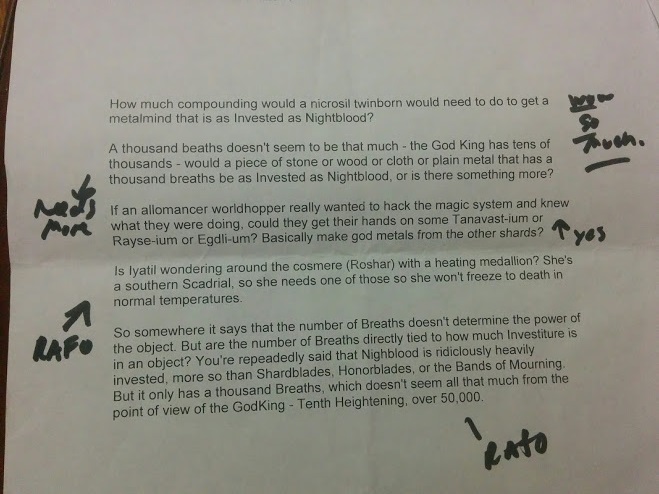 Yeah, a more precise system of how many breaths it takes to do X (and the exchange rate, so to speak, with other magic systems) is something on the list to do for Warbreaker 10th anniversary. I have the resources now, with more assistants behind the scenes, to get more precise on this sort of thing than I've done before. However, I wondered if—perhaps—there are perfect steps of colors just like there are perfect tones, with color fifths, sevenths, and chords and the like. In our world, nobody has the ability to distinguish these things—but what if there were someone who could? Someone who could tell something innate about color that isn't at all subjective? I'm not sure if I explained that right, but it intrigued me enough to become part of this book. Can you store Breath in metal without the [Ninth] Heightening? Just put it there without Awakening, just to hide the Breath. Can you hide Breath in-- Yes you can hide Breath in things. Metal in particular, without the [Ninth] Heightening could you put it into metal. Without the purpose of Awakening it, just storing it there. Oh without the [Ninth] Heightening-- I would say yes you could. You said previously that someone with synesthesia wouldn't be affected by Heightenings differently, unless they had a lot of Breath. What would those effects be? It's going to depend on the type of synesthesia, because there are so many different types.